How To Make BerryWorld Blackberry Almond Tart. Are you looking for a nice treat recipe? With added yummy berries? BerryWorld Blackberry Almond Tart anyone? Blackberries in a delicate almond sponge makes a perfect pudding or pack lunch and tea time treat. 1. Place the fruit in a small pan with 50g of the sugar and warm through until the juices begin to rest. Remove from the heat and cool. 2. Preheat the oven to 200C/400F/gas Mark 6. Roll out the pastry on a lightly floured surface large enough to line an 18cm loose-bottomed flan tin. Ease the pastry gently into the corners without stretching and trim the edges. Chill until required. 3. In a mixing bowl cream together the rest of the sugar, the almonds, butter, eggs and flavourings until soft and well blended. 4. Spoon the fruit into the pastry case, spread over the topping and flatten. Place in the oven and bake for 30-40 minutes or until the topping is set and light golden. 5. Serve warm or cold topped with the flaked almonds and a shake of sifted icing sugar. How To Make BerryWorld Blackberry Almond Tart. Recipe and images courtesy of BerryWorld. 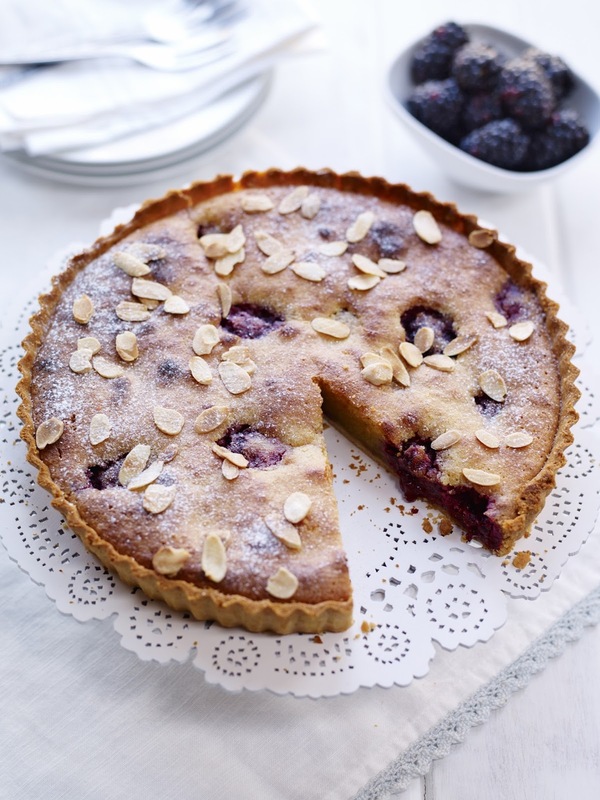 What do you think of this BerryWorld Blackberry Almond Tart? Fancy a slice or two? A perfect treat for your elevenses too with a nice hot drink. You may also like these other BerryWorld Recipes. Or maybe you are looking for some other tasty Blackberries Recipes? I also have another recipe post scheduled for later so do not forget to stop by again. "How To Make Portobello Veggie Burgers"
"How To Make British Asparagus, Mozzarella And Bacon Sliders"
I will take a slice of that any day it looks divine. Plus what camera do you use your photography is gorgeous! Wow…this looks so pretty!I would love for you to share this with my Facebook Group for recipes, crafts, tips, and tricks. Thanks for joining Cooking and Crafting with J & J! This is the first time I've seen a recipe using gram measurements. Blackberries are one of those fruits I can only use in something like this, sounds and looks delicious.